With the aid of our hardworking professionals, we have been able to come up with a gamut of Crescent Knives & Blades. We offer our customers a wide range of Crescent Blade, Crescent(Tunnel) Knife, Crescent Knives (Tunnel) Extra Thin and Tunnel Crescent Knife, under this category. The offered knives and blades have sharp edges with straight sides and a rounded tip. These knives and blades are offered by us at highly competitive prices. Supported by a team of sincere professionals, we have been able to offer Crescent Blades to the customers. All our products are developed employing latest machines and technology in sync with the norms laid down by the industry. The offered blades have sharp edges with straight sides and a rounded tip. 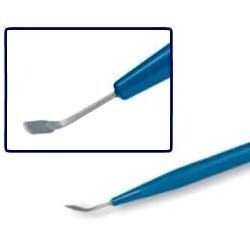 Our offered blades are ideal for perfect scleral tunnel flaps and are offered by us in two varieties. On offer from us is a wide and commendable gamut of Crescent (Tunnel) Knifes. We offer these knives to the clients with full handled eto. Our offered knives can be availed by the customers in sizes such as 2.0 mm, 2.2 mm, 2.50 mm, 2.65 mm, 2.75 mm and 2.8 mm. Moreover, we offer these knives in models such as angled and straight/bevel as per their needs. Before the end delivery, all our products are stringently checked by the quality analyzers on varied parameters to ensure their durability. We are offering a wide range of Crescent Blade to our valuable customers. Our ophthalmic full ranges as Includes Crescent (Tunnel) Blade Sizes - 1.2 mm, 1.5 mm, 1.8 mm, 2.0 mm, 2.2 mm, 2.60 mm, 2.80 mm, full handled knives. We are providing OEM buyers Services Available. These Crescent Blades are available at industry leading prices. 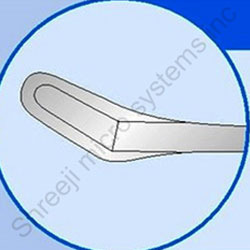 Crescent Blades: for making groove tunnel very thin blades & very easily sliding during surgery. With the implementation of advanced technologies and negligent efforts of our professionals, we offer optimum quality range of Tunnel Crescent Knifes. The offered range of crescent knives are developed using angulated stainless steel in compliance with the international medical standards. 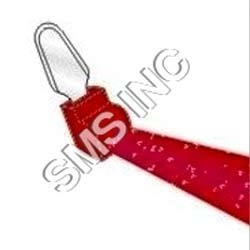 These knives can be availed by the customers in varied specifications in order to meet their demands. We offer these knives to the clients at market-leading prices.